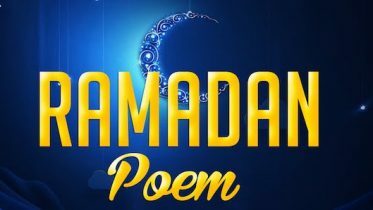 The blessed month of Ramadan has come to an end and, Insha Allah, we would have all had a successful and beneficial one. It means therefore that we would have put into our ‘account’ something of good and it also means that we would have polished our hearts and removed some of the stains and spots that would have been on it. ; we should not try to add new stains on it. Instead of doing so we should endeavour to keep on polishing it and keeping it shining. If we extend this idea to our own deeds it indicates that we should not nullify the good that was done by reverting to the old, sinful ways. Every time we do, say or think something, be it good or bad, it creates an impression on the ruh. Besides the fact that all our thoughts and actions are being recorded in our book of deeds; they either contribute to the polishing or staining of the ruh. If you commit wrong it is as the ayat says above; you are clothing or covering the good with what is not beneficial here in this life nor in the next. The stains and spots on the ruh can be removed by doing good, and in the same process we are also polishing it. So the choice is ours. We can either clothe it or have it bright and shining. This is our daily challenge; purifying our thoughts, words, and deeds because it impacts on our qalb. Those things that clothe and conceal may appear beautiful and desirous but always remember that Satan decorates the evil. So we need to understand that Satan will try to divert our focus by tempting us on a daily basis. So, as the month of Ramadan is over let us make a strong resolution to keep engaging in all the good and refraining from the evil, so when the next Ramadan comes around our status will keep rising higher and higher. This has to be an individual effort; no one else can do it for you. Keep in mind the importance of the intention because all actions are judged on intentions. May Allah make it easy for us and may He purify our thoughts and our actions so that we can continue drawing closer and closer to Him. 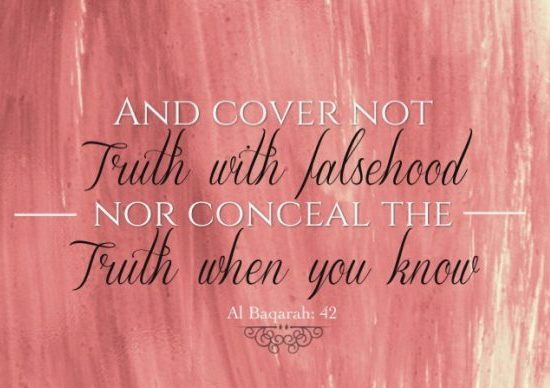 Be the first to comment on "Cover not truth with falsehood"